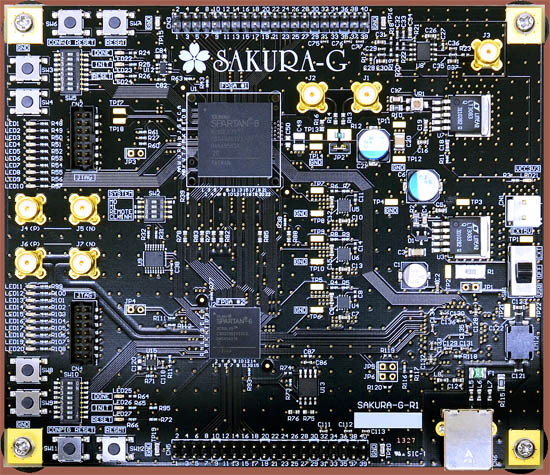 The SAKURA-G FPGA board is designed for research and development on hardware security, such as Side-Channel Attacks (SCA), Fault Injection Attacks (FIA), Physical Unclonable Functions (PUF), and dynamic reconfiguration. Two Spartan™-6 FPGAs are integrated on the board and serve as the controller and main security circuits, respectively. SAKURA-G is highly compatible with SASEBO-GII. A Spartan™-6 LX75 provides a logic circuit 2.5 times larger than the Virtex™-5 LX30 onSASEBO-GII. Ultra-low-noise board design and an on-board amplifier make power analysis easier. Users can easily configure and operate SAKURA-G using Verilog-HDL code designed for SASEBO-GII and the free Xilinx® ISE WebPACK design software.